Throughout Jewish Hungary, the name of Harav Tzvi Hirsh Friedman, Reb Hershele of Liska, zy”a, author of the Ach Pri Tevuah and Hayashar V’hatov, was widely revered. He was one of the prized talmidim of the Yismach Moshe, and one of the earliest chassidishe Rebbe’s in Hungary. His son in law was the Tal Chaim, Harav Chaim Friedlander, who assumed the position of his father in law after his passing. 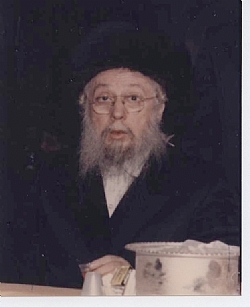 His son was Rav Tzvi Hirsh Friedlander, and his son was Harav Yoizef, the previous Liska Rebbe, who arrived in America in the immediate aftermath of World War II—an ud mutzal me’eish— and established his beis Medrash in Boro Park on 50th Street very early on, when Boro Park was barren from chassidus. 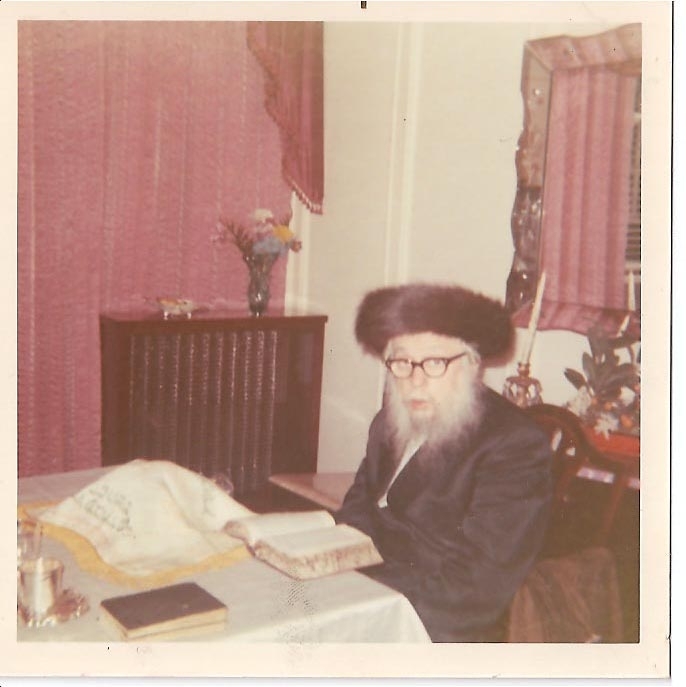 In honor of his 45th yahrtzeit ( 28th of Shevat), we feature the arrival of this leader who inspired the families and community of Boro Park of yesteryear. In his youth, his hasmadah, diligence and brilliance in Torah garnered him hor’ah from some of the foremost ge’onim in Hungary, such as the Binyan Dovid of Ihel, and the Mashmia Shalom of Niderhaus, and others—all of who lauded his Torah scholarship and his brilliance. He met his father in law, Harav Avraham Yehohua Heshel Frankel of Hivnov-Lublin, a very close descendant of the holy Chozeh of Lublin, only once because he became engaged to, ybl”ch, his eventual Rebbetzin Nechama during the war, when she was separated from her family—and he was murdered al Kiddush Hashem. His Rebbetzin is descended from the greatest luminaries in Chassidus and was exceptionally close to the Belzer Rebbe during the war years . Rav Yoizef suffered the war years in forced labor and in hiding in Budapest while his extended family were deported to Auschwitz—along with so much of Hungarian Jewry—in 1944. This is where his father, brothers and their families perished al Kiddush Hashem. And then he made his way to America, and brought with him the old brand of Yiddiskeit. He was welcomed here with much anticipation as is evident from many of the Yiddish papers of the time who heralded the arrival of this bnan shel kedoshim, a remnant of the prewar world—and many prominent Rababnim of New York all came out in his honor. One kabbalas panim is announced by Chevrah Nachlas Tzvi on the Lower East Side. This shul was indeed founded in the name of Rav Hershele of Liska by immigrants who hailed from the Liska region, and knew the holy tzaddikim of that court. In addition, there were other receptions in the Galicianer shul, and elsewhere, where people were invited to hear him lecture in Torah, and to relate his terrible experiences in the labor camps. Harav Yisroel Lebovitch, the Rav of the Shul Levushei Modechai at 636 East 6th street married into the Liska family and he too asked the Yidden of New York to come and meet his illustrious cousin. 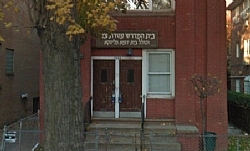 In 1947—relatively very early for a chassidisher Rebbe—he made the move to Boro Park; 1449 50th Street, where the shul remains today, and he infused those Yidden of Boro Park with Torah and chassidus. 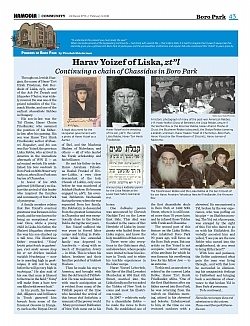 The second part of this feature on the Liska Rebbe who inhabited Boro Park 70 years ago will focus on the Boro Park years. But any article on Harav Yoizef, zt”l, is not complete without writing of the attribute for which he was famous; his overflowing love for his fellow Jew—to all extremes. To this end, an anecdote is related by the current Liska Rebbe, Harav Tzvi Hersh Friedlander Shlita “One of the first Shabbosim after my father moved into Boro Park, as he was returning from the mikvah on Shabbos morning, and he, attired in his Shtreimel and bekeshe (unbeknownst to him at the time no one ventured outdoors with a Shtreimel), encountered a Yid, broken by the war experience, who was puffing on his pipe—on Shabbos morning. The Yid, out of pure pain, was enraged by the sight of this Yid who dared to go on with his Yiddishkeit. He verbally accosted and yelled, “I see you are the new Rebbe who moved into the neighborhood, do you want to bring Hitler here? !” With love and patience, the Rebbe understood what pain the man was living through… and with that very love he succeeded in eliminating his antagonistic feelings to Yiddishkeit and bringing back to a semblance of observance to that broken Yid in Boro Park of yesteryear. His lev tov, an overflowing love for every Yid that he encountered—including the many broken Yidden, Holocaust survivors who inhabited Boro Park in those days, was legendary. 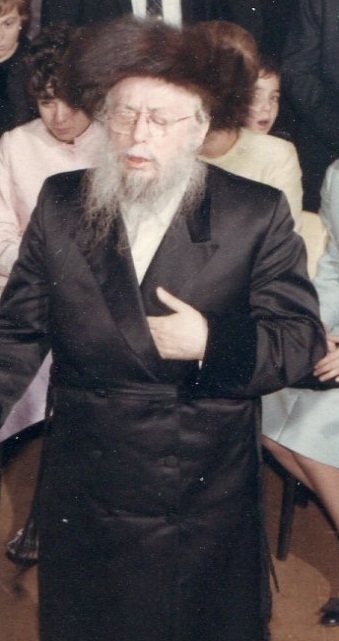 The current Liska Rebbe, Harav Tzvi Hersh Friedlander, related about his father’s decision to settle in Boro Park—something that was rare in that time, immediately after the churban when most of the she’eiris hapleitah elected to go to the Lower East Side, Crown Heights and Williamsburg. “It was very important to him to establish a shul that would allow him to somewhat resurrect the destroyed link and tradition of marbitz Torah v’chasidus of his holy zeides and enable him to continue the mesorah of his forefathers whose tenure in Hungary had been brutally cut short, Hy”d. “In hindsight, there seem to be two main reasons that he came here, to Boro Park. He had cousins, descendants of the brother of the Tal Chaim of Liska, fellow members of the Friedlander family who resided in Boro Park, who said that they would help him establish a bais medrash if he would come here. He initially attempted to rent a home, but when the owner realized that he was going to make a shul here, he immediately objected. That is when he realized that he would have to purchase a home. There was a real estate broker in Boro Park by the name of Reb Avraham Englard, and he showed the Rebbe around some homes. And indeed the house on 50th Street, between 14th and 15th avenues that he eventually bought was only after receiving assurances from the Chernobyler Rebbe, Harav Yaakov Yisroel Twersky ZT’L (whose bais medrash was nearby on 49th Street, off 15th Avenue) that not only does he not object to his opening a bais medrash but encourages him to do so to help facilitate the growth of the community. In fact, he even instructed one of his mispallim Reb Yaakov Hersh Bindiger to daven in the newly established Liska Bais Medrash telling him “the Liska Rebbe’s rebbitzen is a Koznitzer einikel and so are you”—that was the atmosphere and relationship that existed between these two Rebbes. Indeed, his shul became a gathering place of healing for so many Yidden from the surrounding area. His derashos were a confluence of an exhortation to a life of Torah and yira’s Shamayim—but with his trademark love with which he caressed their souls. The first benches that he took for the shul, was from the Eitz Chaim Yeshivah, on 13th Avenue and 50th Street (Solomon Plaza). Harav Yoizef of Liska possessed a deep desire to bring honor to his holy ancestors and every move was always ‎with that thought. One of the notable accomplishments of Rav Yoizef was the publication of the commentary on Tehillim of his father, ‘Sha’rei hayosher’. He was also an exceptionally warm ba’al tefillah that warmed the hearts of all those who came, and immediately on that first Yamim Nora’im, several minyanim came to hear the Rebbe, even from the most distant areas of Boro Park. The following story summarizes the Rebbe’s ahavas yisroel: a Holocaust survivor who lived on the Rebbe's block on 50th st once encountered the Rebbe on the street as he was returning from work without wearing his yarmulka. He described his potential embarrassment realizing the Rebbe would see him yet the Rebbe in his loving fashion had the ability to erase his uncomfortable status by giving him his own yarmulke with an understanding smile. The Liska Rebbe was very close to some of the Rebbes of his time such as the Skverer and Satmar Rebbes. 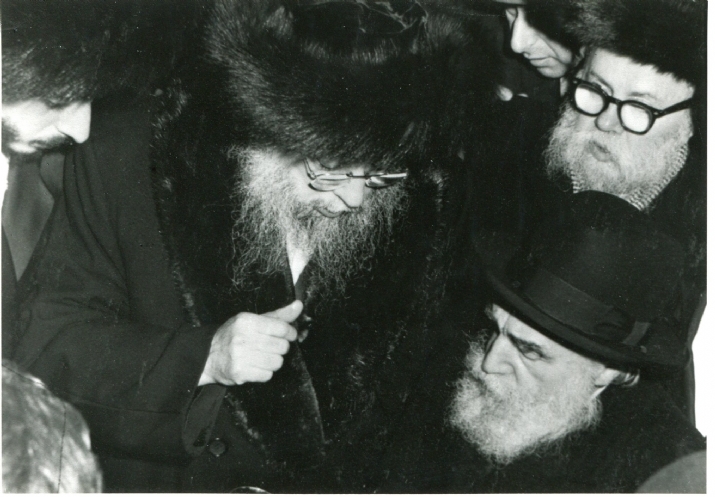 In fact, Rav Yoizef went to greet the Skverer Rebbe, Harav Yaakov Yosef, zt”l, who spent his first two years in America in Boro Park, and only later moved to Williamsburg) by the port. When he saw him coming off the ship with a simple frock, he immediately gave him his own rebbishe bekeshe —thus this was the first bekeshe that the Skverer Rebbe had in America. 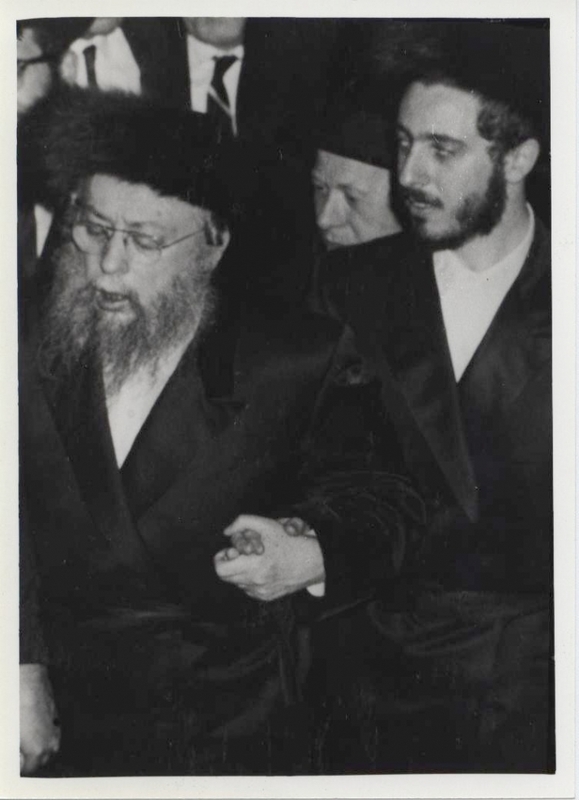 45 Years ago, on 28 Shevat, Harav Yoizef of Liska,at the young age of 52, suddenly returned his soul to his maker, after a sudden heart attack, 8 years after suffering an initial attack, leaving behind a legacy of kindheartedness and caring for a fellow Jew in Boro Park of yesteryear. Today, Liska carries forth its dynasty by the Rebbe’s son and successor Harv Tzvi Hersh Friedlander, Liska Rebbe Shlita. Dancing with his son, ybl”c, the current Liska Rebbe, at his wedding. With Harav Moshe Feinstein at the chasunah of, ybl”c ,the current Liska Rebbe. The Liska Rebbe dancing mitzvah tantz at the wedding of his daughter, tbl”c, Rebbetzin Pearl Gittel Leifer.